Stafford Creek Corrections Center is a mixed custody prison located in Aberdeen Washington. The facility opened in 2000 and can house a maximum of 1,936 male inmates. 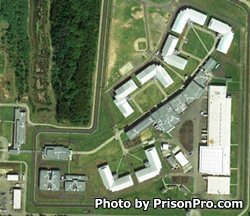 Inmates at Stafford Creek Corrections Center are housed in seven units; H-1, H-3, H-4, H-5 are all minimum custody units, and G-1, H-2, and H-6 are all medium custody units. You will need to know your inmate's unit location in order to visit. Stafford Creek Corrections Center operates a metal fabrication shop and a chair shop that employs offenders. Inmates can also work in various supportive roles within the institution providing laundry and custodial services. Stafford Creek Corrections Center has vocational training for inmates in drywall, roofing/siding, carpentry, electrical, building maintenance, and offers state certification training in technical design and welding. All inmates who do not possess a diploma are encouraged to take adult basic education courses and attempt to earn a GED. Offenders can also take stress and anger management courses, and alcohol and chemical dependency treatment. One of the more unique programs offered at Stafford Creek Correctional Center is the "Bicycles from Heaven" program, which refurbishes bicycles and donates them to the local community. Visitation at Stafford Creek Corrections Center takes place on 11am-8pm on Saturdays and Sundays and is based on a rotating schedule. The schedule rotates the day (either Saturday or Sunday) each unit is allowed to have visits. To view the current visiting schedule rotation click here. For more information read the Stafford Creek Corrections Center Visitors Guidebook. I just left STAFFORD CREEK CORRECTIONS. I left my house in Seattle at 11:10a.m. to travel to Aberdeen to visit my son on April 21,2017, Friday. Only to find out from officer Hamilton that I can't visit my son because it is family night and I am not on the list. I traveled from 11:10a.m. to almost 2:50p.m to arrive to visit. There was traffic congestion in Federal Way and Tacoma. There was road construction workon the road to Aberdeen. It took me almost 4 hours to travel to Stafford Creek Corrections, not to mention the money for gas and the money to put on a debit card for snacks.I get turned away. I feel this is totally unfair. I am 64 years old. Yet I get turned away. Please remember I am a victim too and elderly. I turn 65 years old in 8 months. I understand prisons have their rules but can't acceptions be made for elderly visitors traveling out of town?